My grandmother took a car trip out West when she was a college student in the ’30s, and she kept a kept a diary in which she recorded the mileage she and her girlfriends covered each day, along with what everything cost, and what they saw. She even wrote a little about a brief romantic encounter with a man she met. (“The sun was setting over the canyon, and I was with Don Dugan.”) That diary is a family treasure, both for its insights into my grandma and for how it documents the fairly unusual occurrence of a group of exclusively female tourists traveling a long distance by car during the Depression. A few years ago, though, I was reading the collected Gasoline Alley when I came across a stretch in which Walt and Skeezix took a motoring trip through the West. After a little further reading, I discovered that there was something of a mania for Western tourism 80 years ago, akin to the national obsession with crossword puzzles and hot jazz. After pioneers helped tame, settle, and violently seize the West in the latter half of the 19th century, another wave of Americans repeated the journey in the first half the 20th century, this time as spectators and historians. My grandma was one of a throng. 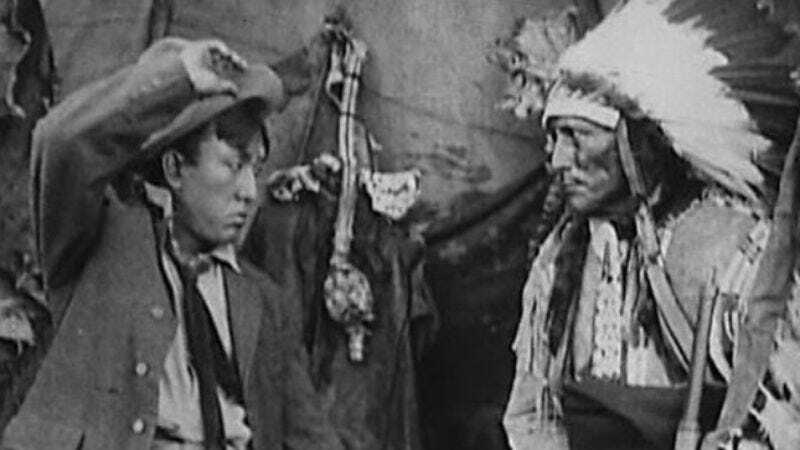 Around the time that movies were becoming widely popular, the old Wild West Shows were winding down, but since the early film producers tried to stick to the tried-and-true entertainment formulas, the movie Western took hold fairly early, copying the mythology promoted by the likes of Buffalo Bill. Only where Buffalo Bill could offer live animals and up-close encounters with famous folk, the movies could offer pictures of the actual spaces where our national legends were birthed (especially after the bulk of movie production moved out to California). D.W. Griffith’s 1910 short “Over Silver Paths” is a prime example of how location shooting elevates conventional genre fare; the way Griffith emphasizes the vastness of the desert established a blueprint that filmmakers like John Ford would later follow. Even the films in Treasures 5 that are essentially advertisements—like 1921’s “Sunshine Gatherers,” a hand-tinted mini-history of California that’s really a pitch for Del Monte—make the land look so imposing and unspoiled that it’s easy to imagine them as footage of the exact time and place where the heroes and villains of our distant past rode through. It’s no wonder then that people like my grandmother built entire vacations around seeing these places firsthand. And it’s no wonder that the Western endures as a genre, even as it waxes and wanes in popularity. In part, we’re drawn to the West because the scenery is gorgeous and the stories so primal: all about men and women carving out a place for themselves in a region with few laws to restrict them. And we’re drawn as well because we’re repeating the fascination of earlier generations. We revamp and reconsider the Western with each passing decade, driven by our nostalgia for the nostalgia of the past. The most fascinating films on Treasures 5 show how even that idea of controlling and revising the story of the West is nothing new. Consider 1914’s “Ammunition Smuggling On The Mexican Border,” produced by former Texas sheriff Eugene Buck, who also stars in the three-reeler as “himself.” The film was made to tell Buck’s side of the story of his fight against the Mexican revolutionaries who kidnapped him and shot his deputy. At the time, Buck was being hailed as a hero by some and vilified as a liar by others, so “Ammunition Smuggling” was his attempt to create a kind of permanent record of what happened—or at least what he wanted everyone to think happened. In Scott Simmon’s Treasures 5 program booklet, he notes that the events depicted in “Ammunition Smuggling” took place about four months before the movie was made, and in the same place and year where The Wild Bunch is set. That kind of “cinema as newspaper” element to Treasures 5 is a large part of the set’s appeal, because while the West may have been largely tamed by 1913, the landscape of cinema was still wild and wide-open. For The A.V. Club’s take on previous editions of the Treasures series, click here, here, and here.